Who provides similar services to W3? W3 Stands Above the Rest! As it relates to Cloud Computing, W3 has many competitors. 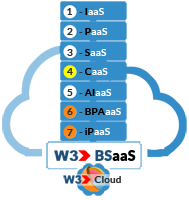 Using W3's Business Solution as a Service (BSaaS) offerings, W3 stands above the rest as we are the ONLY all-inclusive service provider who empowers organizations with everything they need to run their entire business in the Cloud via a single service provider. 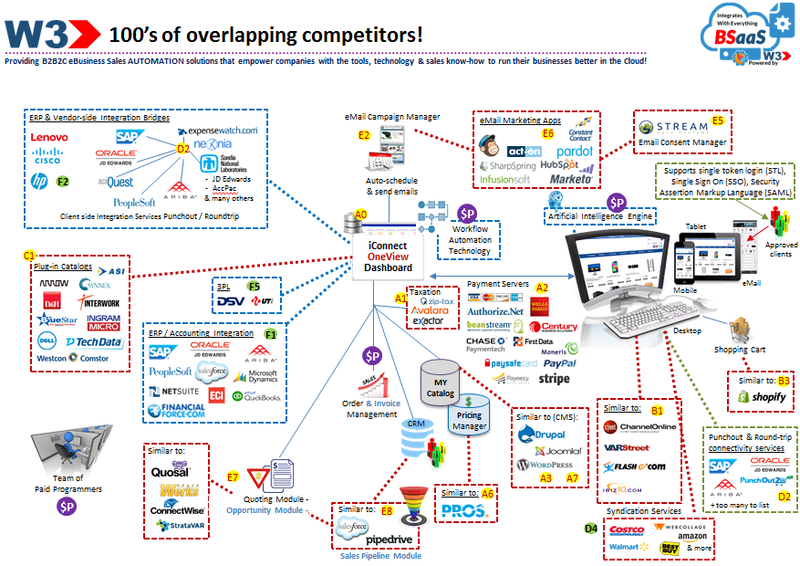 The following diagram lists the TOP Cloud service providers in each category. 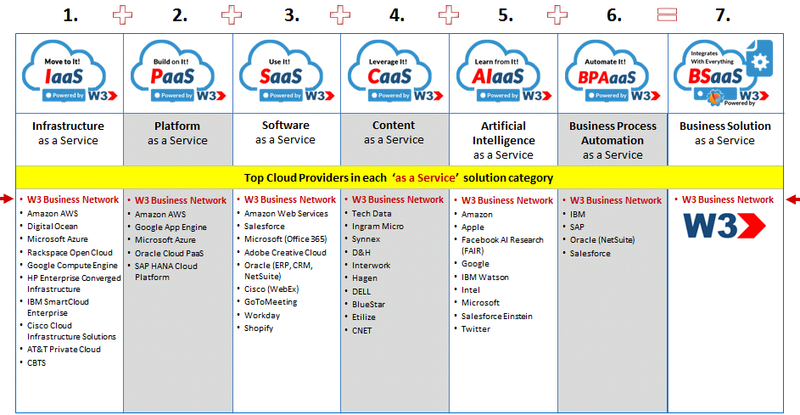 High-lighted in RED, W3 is the ONLY Cloud service provider that's offers a service in each of the TOP 6 service category. The resulting effort is that W3 stands alone when it comes to offering a complete business solution using a single Cloud provider via it's Business Solution as a Service (BSaaS) offering as seen in category 7. 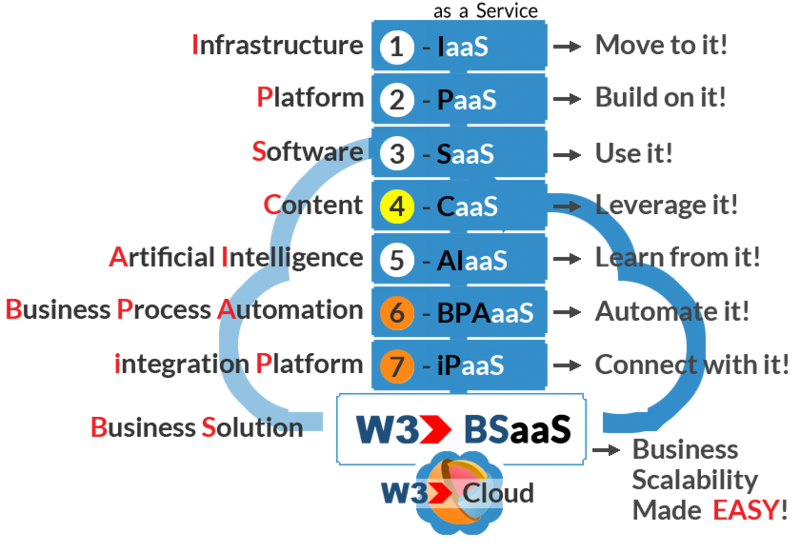 The W3 BSaaS offering is the ONLY cloud-based end-to-end business solution that incorporates ALL of today's most popular Cloud Services in a single platform, including; IaaS, PaaS, SaaS, CaaS, AIaaS and BPAaaS that makes it EASY on organizations to run their entire business in the Cloud. W3 empowers businesses with the EASIEST, FASTEST and most SCALABLE solution in the industry. W3 offer 100's of Apps! W3 offers 100's of Apps that enable organizations to streamline, automate and integrate all their end-to-end business processes into a fully integrated workflow process. W3 provides everything from managing Customers (CRM) to Marketing & Lead Generation to Quoting to Orders to Procurement to Fulfillment to Invoicing and to Communicating with your accounting / ERP systems while offering customers a 24/7/365 post service support portal that makes it EASY on customers to do business. W3 has many overlapping competitors! W3's extensive library of integrated business applications, makes it an EASY to overlap onto similar single focused services providers. If you were to replicate ALL the services that W3 offers from its fully integrated ALL Inclusive eBusiness platform, you would have to license at least four (4) or more application services from different cloud-based service providers along with hiring at least one full time programmer to help you maintain and integrate these services with your internal legacy systems. With W3, you get everything in a SINGLE scalable Cloud platform using minimal resources, BETTER technology and at a MUCH lower cost. 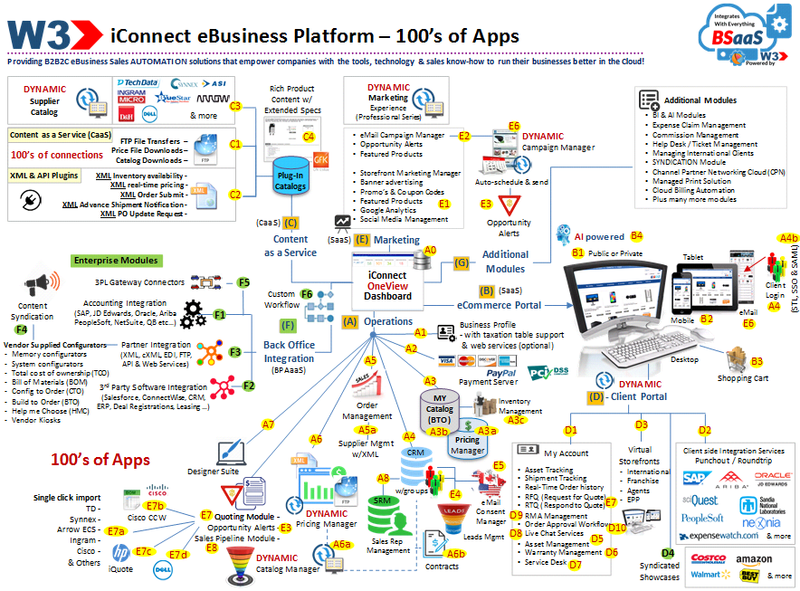 Using W3's 'Integrate into ANYTHING' platform to streamline, automate and scale your business in the CLOUD, is EASY! W3 makes it EASIER on customers to streamline, automate and integrate their entire end-to-end business processes in the Cloud.